I don’t have a cover photo for this yet since it’s still quite a ways out from publication. It’s awesome! It’s a little bit steampunk, and a western, AND it has zombies in! what more could a girl ask for? Our primary protagonist is named Jett, a young woman from Louisiana who is out west searching for her twin brother. He went missing during the Civil War and she’s convinced that he’s somewhere in the wide open spaces of the western territories. Of course, she can’t just travel as a genteel flower of the South. Jett has disguised herself as a gunslinger and has the skills to back up her costume. She’s small and looks young so people test her frequently. When she gets into yet another saloon brawl she has no reason to think that anything different will happen this time. However, her private argument is broken up by a horde of zombies! Only the fact that her horse is brave and loyal saves Jett from the horrible fate of the rest of the town. Outside of town Jett runs into the other two driving forces of this book; Miss Honoria Gibbons, a socialite and inventor from San Francisco, and White Fox, a freelance scout for the Army. Tensions are initially high as Jett has no reason to like those who worked for the Union army, but White Fox soon proves a staunch ally and a good friend. Both Honoria and White Fox are in search of the same thing. Entire towns have been going missing all over the southwest. Honoria’s father is a rich, but terribly gullible man. Shysters have written to him claiming that flying machines have come and stolen all the people. They could bring him proof, for a modest consideration. Honoria travels constantly trying to debunk the hundreds of crooks who write to her father. She uses her travels as chances to test out her new inventions. Her latest invention is a sort of steam-powered horseless wagon with a few surprises for less than friendly visitors. White Fox is also following the path of the missing. He was asked by a soldier to find out why his family had stopped writing. When he arrived at the settlement he found everyone gone and signs of a struggle. He began to track rumors and follow clues until he arrived at the same place as Honoria and Jett. Together, the three new friends will try to discover what the creatures that attacked Jett and the townsfolk are and who or what created them. There are definite overtones of COWBOYS VS. ALIENS here, but only in the best ways. The two authors have come up with engaging characters and a fantastic world for them to play in. There are indications that this will not be the last we see of Jett and her companions, and I for one, am hoping for many more books! What can I say about how much I love this series? It’s magically delicious! RENEGADE MAGIC is book 2, following KAT, INCORRIGIBLE, which will be out in paperback in April. It’s Jane Austen for the Harry Potter crowd. Kat is the youngest of three girls. Her father is an absent-minded vicar and her stepmother is a horror. She’s not evil, she just desperately wants the family to be respectable and fine. Kat is not respectable. Her mother, you see, was a witch and the witchcraft has passed to her daughters. Kat however, has gotten a little more than her sisters. Their mother wasn’t just a witch. She was actually a Guardian, one of the people entrusted with special powers to defend the realm against the misuse of magic. Kat has inherited her powers, her responsibilities, and her enemies. Kat’s oldest sister, Elissa, is terribly respectable. She would never dream of doing anything so outre as using magic. The middle sister, Angeline, is a little too interested in magic. In fact, in book 1 she accidentally ensnared a suitor using magic. Now his mama has burst into Elissa’s wedding shouting accusations and casting aspersions on the entire family. With Elissa gone on her honeymoon, Kat and Angeline are left to deal with Stepmama alone. She decides that the only thing to be done is to take the girls to Bath and try to get Angeline safely married off to someone who doesn’t know about the magical skeleton in the family closet. Kat soon finds herself in a difficult position. Her brother is dodging in and out of the house, obviously up to no good. Her sister is taunting the most notorious rake in Bath in an attempt to drive Stepmama into apoplexy. The entire family is staying with relations who may be under the misapprehension that Lady Fotherington, Kat’s greatest opponent, is actually, her godmother. To make things worse, Lady Fotherington has had Kat banished from the hall of the Guardians. Kat is on probation, one step out of line and her powers will be bound. But there is more going on in Bath than family troubles. Someone is using the ancient Roman baths to draw power and Kat’s idiotic older brother is caught up in it. Soon, so is her hostess’s youngest daughter. And Kat’s Guardian mentor won’t believe a word she says about Lady Fotherington, the buildup of wild magics in Bath, or the danger to her family. Once again, it looks like the incorrigible Kat will have to save the day on her own. This is a sweet book, which again, is part of a series. (I love series books. They’re like meeting up with old friends.) Clover Twig is a neat, tidy, young girl who does housekeeping for a witch named Mrs. Eckles. She’s a nice witch, if a little behind the times. Unfortunately, as is so often the case, Mrs. Eckles has a horrible sister named Demelza. Clover thwarted Demelza in an earlier book (CLOVER TWIG & THE MAGICAL COTTAGE) and Demelza is out for revenge. Meanwhile, the Perilous Path has shown up again. The Perilous Path entices the unwary onto itself and then throws them up against seven magical dangers. When Clover’s baby brother goes missing everyone suspects that he has been lured onto the path. Clover and her accident prone friend Wilf set off onto the path after him. Mrs. Eckles stays behind to provide logistical support through the latest in crystal ball technology. She cannot risk setting foot on the path. Everyone knows it turns witches mean. Just look at her grandmother. Or her sister! 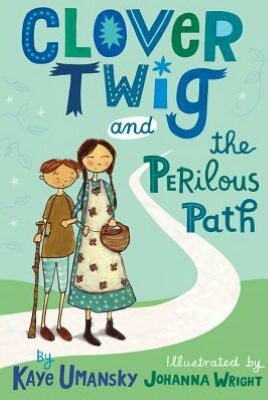 CLOVER TWIG & THE PERILOUS PATH is an adorable book. It’s not terribly complicated as it is written for the 1st – 3rd grade market, but everything, much like Clover herself, is neat, tidy, and in its proper place. In other news, I have given up on both PHOENIX RISING and THE DRAGONS OF BABEL for the time being. PHOENIX RISING just wasn’t holding my attention at the moment. I’ve been in a picky mood. There’s absolutely nothing wrong with the story; it just wasn’t what I was looking for at the moment. THE DRAGONS OF BABEL was also just not filling my needs. I only got through the opening conflict, but it was already a little grim for me. I’ll make a confession. I like happy endings. And not just happy, I like unequivocal happy endings. I don’t want there to be a shadow of doubt that these characters are going to be ok. Now, I can handle quite a bit of trauma along the way, but when I get to the end I need at least an implied ‘happily ever after.’ Maybe it’s a character flaw. I get enough reality in my reality. I want some resolution and happiness in my media. There are books that don’t tie themselves up into neat little packages that I nevertheless love. THE SILVER METAL LOVER by Tanith Lee is a perfect example. That book is beautiful, but it is also tragic. The Joe Ledger series by Jonathan Maberry is another anomaly in my reading habits. It’s an exciting, fast paced series (the 4th book is #9 on my list of 100 for 2012), but no one is riding off into the sunset with a song in his heart at the end of those books. But, on the whole, I like things to end well. I wasn’t getting a warm fuzzy feeling from the direction THE DRAGONS OF BABEL was going in. I’ll probably return to it later. People I respect like it. But for right now, some YA fun and fantasy was more up my alley. working on starting my own website soon but I don’t really know where to get started. Do you believe I should get started with a free site like Pixie or shell out some money into a pay site? I’m facing a lot of options and it’s all so daunting… What would you say?
. Now I remember why I used to adore this blog. back more regularly. How frequently do you update your site.